Lots of insects are beneficial for the environment. We need bees to pollinate our crops and Lady Bugs to feast on predatory spider mites. However, we just can’t think of anything good about fleas. 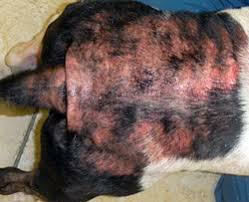 Fleas can cause allergic skin disease in our dogs and cats and carry infectious disease. It was the rat flea (Xenopsylla cheopis) which carried plague around the world in the Middle Ages. 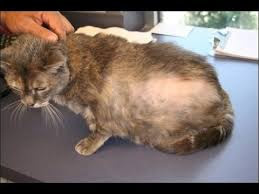 Fortunately, our patients are usually only troubled by the “cat flea”, Ctenocephalides felis, which is a bit misnamed since it loves dogs, cats, raccoons, possums, foxes, coyotes, as well as other wildlife. This flea doesn’t carry plague but does transmit tapeworms, bartonella, and rickettsial diseases to our patients. Fleas enjoy the Pacific NW due to the year-round temperate climate, especially now that most of our pets spend much of their time inside our temperature-controlled homes. 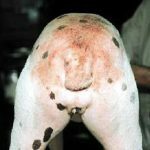 Before better flea control options became available in the 1990’s, a lot of our patients could look like these pictures. Fleas as insects have a life cycle like the butterfly, though not as pretty. They feed on the pet, laying eggs that drop onto the bedding or floor, which then hatch to larvae, pupate, and then emerge as “beautiful” adult fleas. The lifecycle can be as fast as 3 weeks but fleas can “slow” themselves down in cooler weather to take as long as 5 months to pupate. 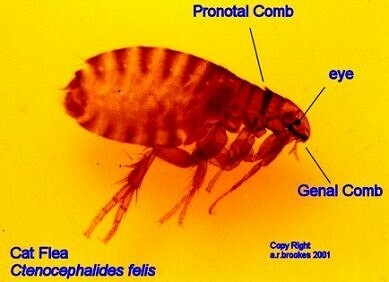 Female fleas lay 40-50 eggs on your pets each day. They can lay 20,000 eggs in their life. OK, they are disgusting but what can we do? The first thing to know is that fleas are a neighborhood problem. Some neighborhoods can have a larger number of fleas based on housing and animal density, along with the number of wildlife reservoirs. Other neighborhoods may have lower flea counts. But whatever the flea burden, the most important thing we can do is use targeted flea products and treat year round. 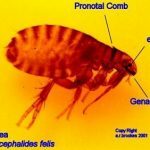 Animals who are bitten by fleas but are allergic often don’t have any fleas on them since they “destroy the evidence” by eating it. Flea products fall into two main categories, topical and oral medications. Most topicals don’t need a prescription, oral products do. Oral products fall into two drug classes: spinosad class or isoxazoline class. Because fleas are big business, there are other products out there as well that you can find here. 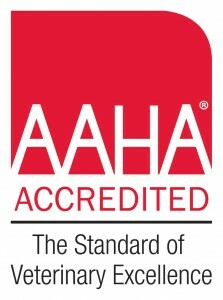 *Fremont Veterinary Clinic carries the products listed in bold. What preventatives do we recommend and why? The number of flea preventatives available can be a bit confusing. Our doctors review all pre- and post-marketing studies from the FDA, EPA, and veterinary research journals before recommending any product because we want our patients to have the safest and most effective medications possible. Isoxazolines are generally safe and also treat ticks and puppy mange but should not be used in any patient with a seizure history. We carry Nexgard since it’s the only drug in its class that’s safe in puppies and has had the longest time on the market (with adequate time assess for post-approval adverse effects). Spinosad products are generally safe and effective without serious adverse reactions. We carry Trifexis since it also prevents heartworm and intestinal parasites. 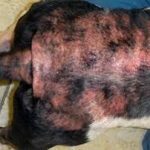 Spinosads can’t be used in dogs being treated for demodex (puppy mange). Spinetoram (Cheristin) is a monthly topical similar to spinosads in being a natural product of a bacteria (Saccharopolyspora spinosa). It is highly effective in field trials against cat fleas and is generally safe without dermal toxicity or carcinogenicity. The only isoxazoline available for cat is topical Bravecto. This product is generally safe but it should not be used in pets with a history of seizures. Really good flea control requires four avenues of attack. Treat all the pets in the household (Pets may appear to get “worse” in the first 30-50 days as baby fleas hatch out of eggs and pupae since these are nearly impossible to kill). Remove flea eggs, larvae, and pupae from the household. Usually mechanical removal (Vacuuming and bedding wash) is sufficient but if there is carpet, premise spray may be necessary. 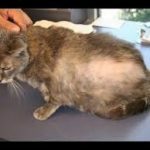 Consider outside sources: if there are wandering cats or wildlife who frequent the yard, consider a yard premise spray (Imidicloprid sprays such as Advantage Yard and Premise spray works reasonably well). Gaps in treatment will lead to reinfestation.